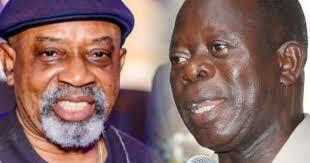 THE Minister of Labour and Employment, Sen. Chris Ngige, has advised the Chairman of the All Progressive Congress (APC), Comrade Adams Oshiomhole, to go for lectures so that he can be versed in little basic issues that guide public governance. Reacting to the threat by the APC chairman to sack him for his failure to adhere to the party directive to inaugurate board of the Nigeria Social Insurance Trust Fund (NSITF), Ngige said the Comrade Oshiomhole needs to be versed in basic issues that guide public governance. Oshiomhole has made an allegation that the minister’s failure to inaugurate the NSITF board, has given the minister opportunity to usurp the position of the board to award contract. The statement read: “For clarity purpose, the Ministerial Tenders Board (MTB) for the award of contracts in any Ministry is made up of the Permanent Secretary as chairman and his Directors, while in the parastatals, the Parastatals Tenders Board consists of the Chief Executive Officer (Director General or Managing Director) and his Directors. “The Minister is not a member and therefore does not award contracts. Similarly, members of the Board of Directors not being members of the Tenders Board of the parastatals do not also award contracts. It is, therefore, a stunningly crass ignorance for anyone to claim that part of the reasons for the delay in the inauguration of the board of the NSITF or any parastatal was to enable the Minister usurp the role of the board as regards the award of contracts. “When the threshold of the award is above a parastatal, such contracts are referred to the MTB for final approval. Such also is the case with the Ministerial Tenders Board threshold which is referred to the Bureau for Public Procurement and from there, to the Council of Ministers called the Federal Executive Council for treatment and ratification. The statement, signed by the Director (Press)’ Ministry of Labour and Employment, Prince Samuel Olowookere , added: “Once more, the minister wishes to state that the reason for the delayed inauguration of the Board of the NSITF was to enable the Administrative Panel of Inquiry set up to probe a frightening degree of corruption amounting to over 48 billion Naira out of which N5billion disappeared in a day without vouchers, complete its assignment.